Tomatoville® Gardening Forums Index > Harvest Time > Our Garden Cookbook™ > 20 November 2016 Sprouted Whole Wheat Bread. 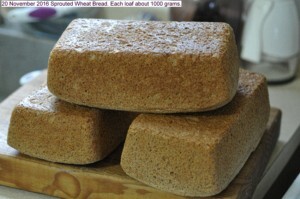 Three loaves about 1000 grams each were made using sprouted wheat and whole wheat flour for mixing. The wheat was Red Fife and it sprouted in two days. Sprouting is terminated when the sprouts appear, meaning there is no advantage in allowing the shoots to get long. The mixing flour was ground up grain not spouted. The usual method is to dry and grind the sprouted grain, but I simply made a slurry with the sprouts and used flour to modify for the bread making. Other ingredients were two tablespoons of salt, three teaspoons of yeast, three tablespoons of white sugar, and a quarter cup of sunflower oil. The balled, kneaded dough was allowed to rise for about two hours until double in size, then shaped into three loaves and these were allowed to rise about one hour before baking at 350F for 45 minutes. All whole wheat bread does not rise as much as when mixed with lighter flour for mixing. This bread is all whole wheat, but not all sprouted whole wheat. To make all sprouted whole wheat it is necessary to dehydrate and grind the sprouted wheat. I avoided this step by using a raw grind of wheat flour. The flavour and texture of the bread is beyond reproach. This reminds me of a previous thread on milling/grinding that I never got to tringy. Not sure how close the result is to compared Durgan's loaf. Both look like a fun project.